Successfully Added Cell Phone Camcorder - Touchscreen Swivel Display DV to your Shopping Cart. 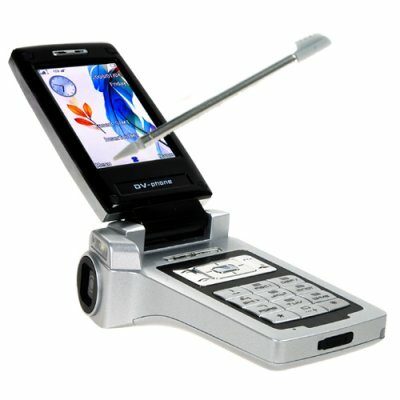 Super DV (digital video) swivel screen cell phone. Are you a citizen journalist or fan of making youtube videos? Have you ever been walking through every day situations and wished you had a DV camera to record something interesting you saw? Well don't ever be caught without your video camera ever again! With this handy dandy cell phone you have both a full functioning mobile phone as well as a digital camera with flip out and swivel screen for easy video recording. This model contains a white LED light and control buttons for higher quality still and motion pictures than you have ever seen from a cellphone. The internal micro SD card slot already contains a 512MB card, so the phone comes out of the box ready to start taking pictures and video. This is not only a fun DV phone, but also a useful business phone. With two SIM card slots, native three GSM frequency band, and easy navigation touch screen interface, it is easy to make and receive calls on this technology marvel. Another unique mobile phone brought to you at the usual low Chinavasion wholesale price, order your stock today and prepare to be amazed. Touchscreen cellphone with dedicated digital video recorder functions. Great phone for people who need a pocket sized DVR to catch any unexpected action. Standard DV zoom and record buttons for easier control during video and still picture recording. NOTE: This product is compatible with GSM at the frequencies of 900MHz, 1800MHz, 1900MHz. Please check with your local provider if you are unsure of your local band requirement.